As you may have heard, unfortunately GameSpy is due to close its servers on the 31st May. 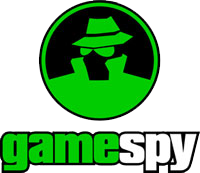 In case you're not aware, GameSpy has been around for a very long time, since 1996 in fact, and was a well established server host used by a large amount of games to provide online services such as multiplayer, leaderboards, and other stat tracking features. The closure of these services means that many games must transition their use of GameSpy's servers to an alternative solution by patching their existing code. While many newer games won't be affected (as of January 2013 the software wasn't available for license), many older ones will, and this includes some Rockstar titles (listed at the end of this article). If you're interested in the history of GameSpy and just why this is happening, our friends at Rockstar Nexus have a nice little write up about it, you may not know that Rockstar actually experimented with using it as far back as GTA III. If you're only interested in how this affects your Rockstar titles, see below. Most changes will only be in the form of stats or leaderboards. As pointed out by Rockstar Nexus, one title Rockstar Games did not mention here is Midnight Club II, which we believe makes use of GameSpy for its multiplayer. Due to the age of that game, we can assume Rockstar will simply discontinue multiplayer features due to (presumed) lack of activity. 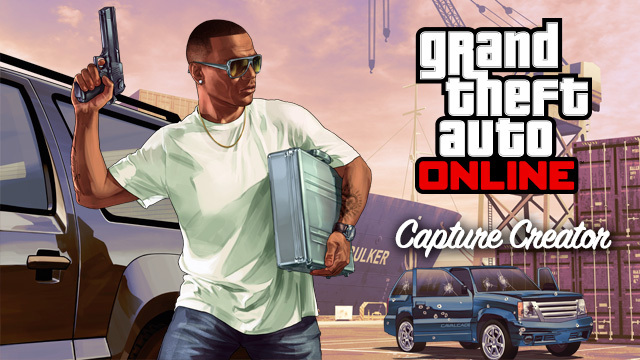 The Capture Creator update for GTA Online we mentioned earlier this week is now available. With over 4 million player-created deathmatches and races already available, the addition of Capture Creator gives the community even more freedom to create their own customised jobs. As they've done in the past with deathmatches and races, Rockstar will be periodically reviewing your creations and deeming the best ones R* Verified. 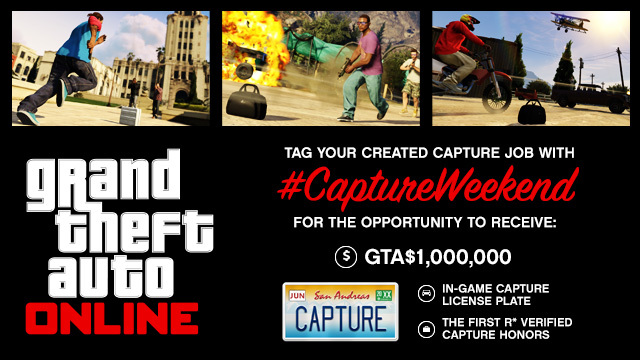 As a little bonus for early birds in the community who are planning to make the first Capture creation masterpieces this weekend, we're going to give 4 creators the opportunity to score a cool $GTA1,000,000 and the exclusive in-game CAPTURE license plate in the�#CaptureWeekend Awards. The four official selections will also join the hallowed ranks of Rockstar Verified Jobs and be invited to join us on a future Rockstar Games live broadcast on Twitch to play through and talk about their creations. We're also extending the�2X GTA$ and RP period�that was originally scheduled to end today through next week - so playing any Capture Jobs, including those made with the Creator tools will earn you twice as much GTA$ and RP until the end of the day on Sunday, April 20th. To submit your published Capture Job for consideration, head to the GTA Online section of Social Club and find your created Jobs. In the details area of the Job you think is worthy, click the Edit Tags button at the bottom, add�#CaptureWeekend to the edit box and click Save. The deadline for submissions is 11:59 PM Eastern on Sunday. See�full terms and conditions here. Pretty big update for GTAV/GTA Online today with Rockstar releasing title update 1.12 for both PS3 and Xbox 360 consoles. There is an absolute ton of changes, fixes, updates etc. which we'll list at the end of this post. Rockstar have also announced that from now until Friday - when Capture Creator arrives - you can get double RP and GTA$ from any of the official Capture jobs currently available. This Friday, April 11th, we'll be adding the ability to construct your own Capture Jobs with the GTA Online Creator tool. This update will let you create Jobs across any of the four Capture Job variants (Contend, GTA, Hold and Raid) and publish them for all to play, rate and share via the�Rockstar Games Social Club. 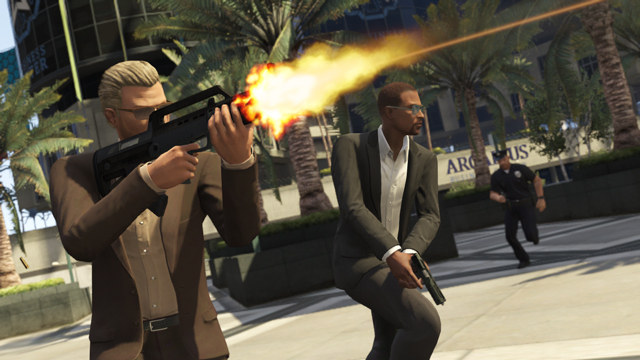 In honor of this forthcoming update, and to help you hone your skills for the wave of new player-made Capture creations to come - from now until Friday, playing any of the official Capture Jobs in GTA Online will earn you twice as much GTA$ and RP. If you haven't yet played Capture Mode in GTA Online, it's a GTA twist on classic capture the flag style confrontations that brings a whole new level of adversarial action to the world of Los Santos and Blaine County. Strategy plays a huge role as you run decoys, set traps and place obstacles to ensure your enemies don�t get close to your goods. bonus RP every time you like or dislike content after playing it, the ability to call Lester and have him instruct the cops to turn a blind eye to criminal activity for a short period of time, as well as increased payouts for completing Parachute, Races, Deathmatches and LTS Jobs with less than four players. The full change log is far too big to list here, so if you're interested in seeing all the things that have changed, take a look at the Rockstar Support page. Rockstar have just announced their plans for Spring updates to GTA Online, including (finally) the addition you've all been waiting for: Heists! Non-contact option for races. Since so many twats seem to have no idea that "Race" and "GTA Race" are two different game types, R* have finally added an option to turn off collisions (with other players) meaning we can actually have fun and go racing for real now! Running out of space to store all your vehicles or just looking for another place to chill? 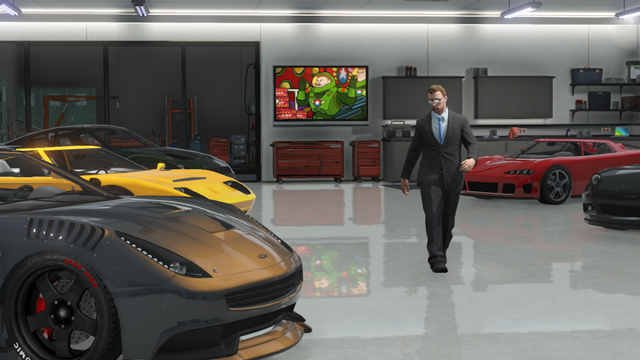 You�ll soon be able to own multiple properties in GTA Online as part of the forthcoming High Life Update. Get ready for lots of exciting Grand Theft Auto Online updates to be added throughout the spring and beyond. Here's a brief rundown of some of the new content, features, and enhancements that you can expect to see barreling down the La Puerta Freeway in the months to come. Capture Creator:�Coming next week, the Creator community will be able to make their own original customized Capture Jobs and add to�the over 3.5 million (and counting) player-created Deathmatches and Races�currently available on Social Club. Strategically place pick-ups, define weaponry, set location, and tweak tons of other variables to make your own unique Capture Job for others to take on. We will also be reviewing your homemade Capture creations to stamp standout experiences as Rockstar Verified. The High Life Update:�The High Life Update will allow you to expand your foothold in Los Santos with new high-end apartment options, the powerful Bullpup Rifle, new wardrobe items, the Dinka Thrust motorcycle and three new lavish cars to choose from, including the Super class Pegassi Zentorno. The High Life Update will also feature the debut of multi-property ownership in GTA Online, which means you'll be able to own two distinct properties (with garages) simultaneously. All this plus the new Mental State player statistic, which is designed to let you see just how passive or psychotically unhinged fellow players in your session really are, and a slew of new Jobs. Heists:�Coming this spring to Grand Theft Auto Online, team up with your most trusted Crew members or with random other mercenaries in Grand Theft Auto Online to pull off cooperative Heist Missions for glory and profit. We know many in the GTA Online community have been looking forward to this update � stay tuned for much more information to come. 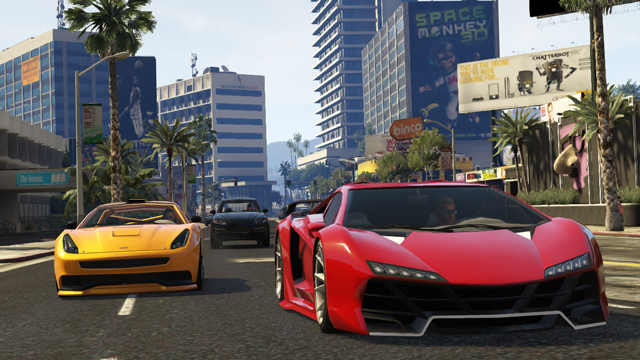 The new Dewbauchee Massacro and Pegassi Zentorno racing down West Eclipse Blvd. Ever since the launch of GTA Online, we've been continuously monitoring how the community is playing the game as well as all player feedback sent to us at our�[email protected]�address to see what you�re liking, disliking, and what should be addressed in upcoming GTA Online Title Updates. A recent update addressed an issue that we saw with the way motorcycles and bikes handled while in the air. As it turned out, many members of the GTA stunting community were disappointed to discover that this fix made pulling off certain popular bike tricks and stunts virtually impossible, so we're going to be restoring the original in-air motorcycle/bike physics in an upcoming Title Update. In general, we are open to keeping unintended �glitches� in the game if players enjoy them and they aren�t causing any negative impact to gameplay or fairness in any way. The addition of a 'Non-Contact' option for Races. 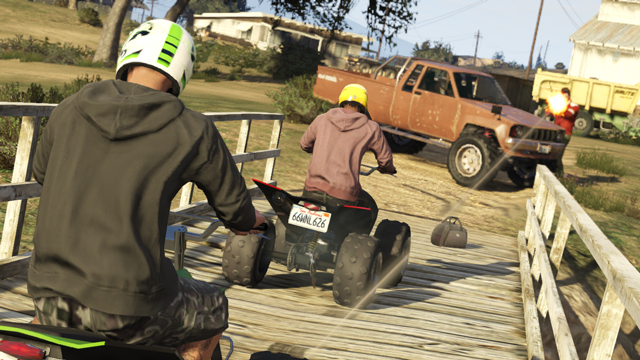 This will allow you to play standard Races with collisions disabled between player vehicles. Other players will appear as semi-transparent and you'll still be able to collide with non-player traffic, structures and other scenery, but this mode - for those who want to play it - will eliminate the "rubbing is racing" mentality that some wish to avoid. We�ll be fixing the issue where players who had upgraded personal vehicles prior to Title Update 1.10 were only able to sell them for ,000. These are just a few of the ongoing tweaks and enhancements in the works � and as mentioned above, we are interested in hearing what YOU want to see, so please�hit us up�and let us know what you'd like to see added to the world of Grand Theft Auto Online.